With my upcoming second birth, I am publishing this post for myself more than anyone. I wrote it just a few months after Vigo’s birth but never published it. But I need to remind myself some of these things now, so here goes…. Visualize what is occurring in you body. You body knows how to give birth. Your uterus is pressing this baby out and working so hard. The best thing you can do is try to relax the rest of your body and give my uterus all the energy and blood it needs to work effectively. It's such a strong and amazing muscle. It's not really pain, it's power. The surges can't be stronger than you, the surges are you. My body is working so hard to push this baby out join it, don't resist it. Know that every surge (contraction) brings your baby closer to you. This really helped me especially at the beginning of a surge. Because I would want to resist the pain, I would start to squirm and tense up and then with Dom's coaching and my practice, I was able to relax and remember that each surge brings my baby closer. We were making progress. Talk to your baby. Between surges I talked to our little boy out loud. Saying how happy I was that today we would meet and encouraging him in the good work we were doing together. I kept on saying, "My baby, we're so happy we're going to meet you. You're doing so well." Relax and rest during breaks in surges (contractions). Along with speaking to my baby, I just tried to breath deeply and relax my body between pushes. I was trying to reserve my strength for when I would work with my body. Remember that this won't last forever. This really helped me during labor. To know that I wouldn't be doing this hard work forever. It would come to an end and it would come to a beautiful end at that. I was just viewing it as a really intense wonderful workout. A marathon that ends with a wonderful gift! Know that women all over the world are giving birth right along with you. And women have been giving birth successfully for centuries. We were made to do this. I have so much respect for mothers now that I am a mother. Giving birth is a big feat, just think of all the amazing women who have given birth to their children. Before giving birth I prepared and practiced for the birth itself. In addition to taking a birthing class at our birthing center I also read 3 books about childbirth, Childbirth Without Fear, Hypnobirthing, and Natural Childbirth the Bradley Way. There is always the possibility for complications to occur during childbirth, but I wanted to plan for the most natural and calm birth possible. Hypnobirthing and Natural Childbirth the Bradley Way were both wonderful resources which explained what is occurring during childbirth. This really helped me to envision my uterus doing hard work and believing that every surge (contraction) was bringing my baby closer to me. These books also provided resources about how to relax your body, to submit and join your body in doing the work. I have never felt so close to nature as I did when in labor, giving birth to my child. I am amazed at how powerful our bodies are. I am so proud and so glad to be a woman and to be able to have joined with my body in the incredible experience of giving birth. Any other moms out there have tips for ways to stay positive during labor? What have I forgotten? I’m a working artist and gallery owner in Heidelberg, Germany. I paint abstract expressionistic mixed media paintings for emerging collectors all over the world. I take care of my babeies part-time and make art and run my creative business part-time. As an artist, I have never been so far along in a body of work, as I am right now. I am continuously learning and using new materials, pushing my practice and boundaries further and further. Parenthood is an inspiring and wild time. My experiences loosing a child, birthing a child, and raising a child have taken me and my painting to places I could never have expected. I taught art for 4 years at an international school in Heidelberg. It was a wonderful time, but during that time I was barely making any of my own work. I studied art in Uni, in Washington State, printmaking, actually and I loved how structured and process based it was. I am all about the process. I learn so much about me and the world when I paint. I’ve been on parental leave from my art teaching job, thank you Germany, and have been focusing on making art in my studio for the past two and a half years. I love teaching. I’m most definitely not done teaching, as a matter of fact I am pre-launching a new online course so stay tuned on Instagram. What creative desire have you been wanting to put into motion? In just 2 days my husband and I are going to be performing and giving a talk at TEDx Heidelberg. I am excited and delighted to share more of our journey there on the stage. Wish us luck. It’s happened. We made it. In just over a week Dominik will be celebrating his 12 new songs, 12 new music videos, and I will be presenting all 12 paintings to his songs he released this year. SO EXCITED for this event! Come and celebrate with me! On the 20th of December we will be presenting all three aspects of the year-long art project. There will be a CONCERT, an EXHIBITION of the 12 large-scale works by me and a chance to view some of the 12 music videos I produced this year! Don't miss out on this EVENT! *Crowdfund supporters as well as collectors of my art get an automatic guest-list spot (free ticket), so please contact me if you have bought a work of mine and are interested in coming to the show. More info about the event on Facebook. Thanks for reading and watching lovelies and see you soon. I cannot be a great mom and a great artist. This is a major limiting believe that I have carried with me the past 10 years, or maybe lifetime. I cannot be a brilliant and prolific artist as well as an attentive and nurturing mother. My career as an artist began, with motherhood. Before this, I taught art for 5 years, ran an online vintage shop, and lead creative workshops. But not until 3 years ago, while pregnant with Vigo, did I start painting for me and selling my work. Upon becoming a mother I became an ‘real’ artist. I don’t yet know where this belief came from, I may have to seek counselling on the subject. There is a pressure for mothers in general to always be present with their children. To be there for them all the time. There is also a strong natural inclination to do so. But as a working mama, who wants to thrive at my job and passion and in motherhood, I consistently am confronted with this self doubt about whether I am falling short in both respects. -I take chunks of time in the studio to perfect my craft and build a body of work. Ideally at least 3 days a week. Sharing the childcare time with my husband Dominik. -I make beautiful work that is unique to me, that speaks to and moves people. That adds beauty to this life and (at times) bleak world. -I make a good living as a visual artist, I could do what I love and support my family. We could be flexible and free in our lifestyle and I could be making and selling art to pay all our expenses. -I want to be WITH my children. Enjoying and delighting in them when we spend time together. -My children (1 child so far) are so beautiful and fun. I want to savour my time with them, especially when they are so small, cuddly and their brains are making millions of new connections a day. -Let go of MOM GUILT and know that I am most happy when I am both working in the studio and spending time with my babies. If I were a full-time stay-at-home-mama, I would be pretty miserable. A happy, healthy, and balanced mama is of great benefit to my offspring. A miserable and overwhelmed mama who is around all the time, would not be best for their little hearts’ and brains’ maturity. I am so grateful to share the parenting role 50/50 with my husband. This has freed me up to really take time with my son Vigo as well as put in good and consistent hours in my studio and art career. What a dream scenario. Take time to make, prioritise my studio practice. Wish me luck! I’ve been practicing this the past two years, with Vigo, but I am so excited and delighted to add a new baby to our lives and see how we can make this work, while having two small children in our home and lives. What is a limiting belief that you believe? Imagine the possibilities if this were possible. What would it look like? It is possible. With a supportive partner, even pregnant ladies and tired moms can have thriving businesses. Allocating roles makes life smoother. We have finally, after 7+ years of marriage, realised that Dominik doesn’t dislike cooking as much as I do, and I don’t mind cleaning as much as he does, so Dominik does most of the cooking and I do most of the cleaning. We haven’t had an argument about cleaning yet this year and it used to be a weekly quarrel. Getting rid of clutter in our home makes cleaning and tending so much easier. I have a lot of wisdom/resources to share, I just need to take the time to do so. If I keep making art and putting my art out there, I will keep selling. Our kids are tiny for such a short time, I want to savour every moment of it. My personal art style emerges when I keep making and following my intuition. 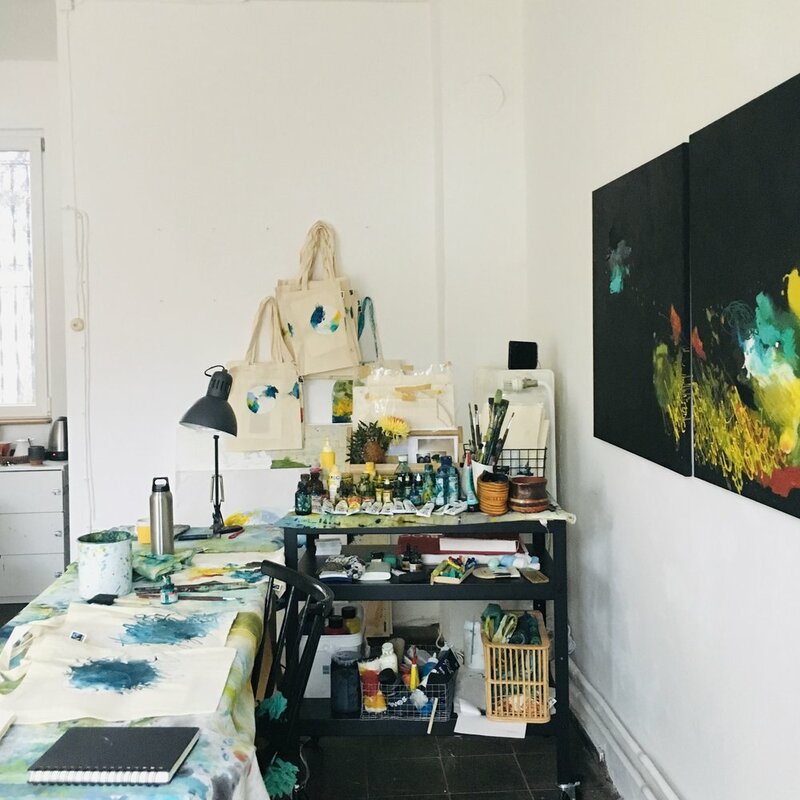 I thrive when working outside of the home, in my studio. Dominik and I can work together well and create a beautiful body of work inspired by one another an our experiences. We haven’t always been the best at collaborating artistically. I am very independent and usually don’t like input in my artistic practice. But this year I enjoyed creating a large scale abstract painting to every one of his new songs he released. It has been a wild ride for us and I am so proud to share the whole project with Heidelberg on December 20th, at Karlstorbahnhof in Heidelberg. What is one lesson you have learned so far in 2018?